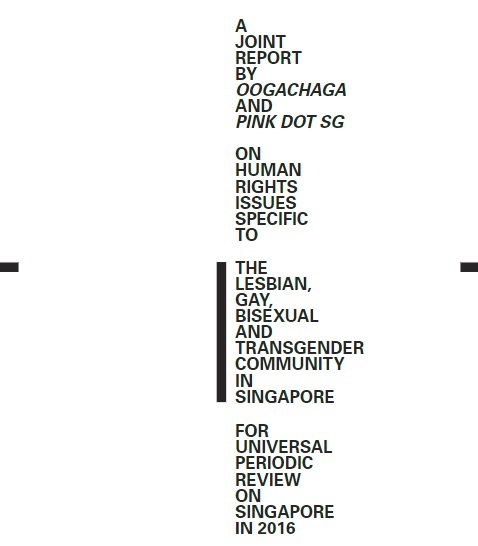 In 2015, Singapore's Ministry of Foreign Affairs (MFA) invited several LGBT groups, including Oogachaga and Pink Dot SG, to participate in the Universal Periodic Review (UPR) by the United Nations Human Rights Council, on the state of human rights in Singapore. This culminated in the submission of the joint report by Oogachaga and Pink Dot, as civil society stakeholders, for consideration by the Human Rights Council in January 2016. As part of raising awareness of the key issues and recommendations summarised in the report, we worked closely with local cartoonist Otto Fong to develop a series of comic strips. The Registrar of Societies, under the Societies Act, refuses registration of LGBT organisations, apparently because it is “contrary to the national interest” to do so. Mainstream media guidelines prohibit broadcast of music or programmes that positively portray LGBT persons and lifestyles. LGBT students lack access to professionals who can provide accurate LGBT sexuality and sexual health education. Educators and professionals in mainstream education are not empowered to handle homophobic and transphobic bullying. LGBT youth in Singapore are exposed to Reparative Therapy in order to change their sexual orientation and/ or gender identity. Internationally, these practices are denounced as harmful and unethical. You could be fired from your job, denied a promotion, bullied or blackmailed for being LGBT, and there’s no employment protection.